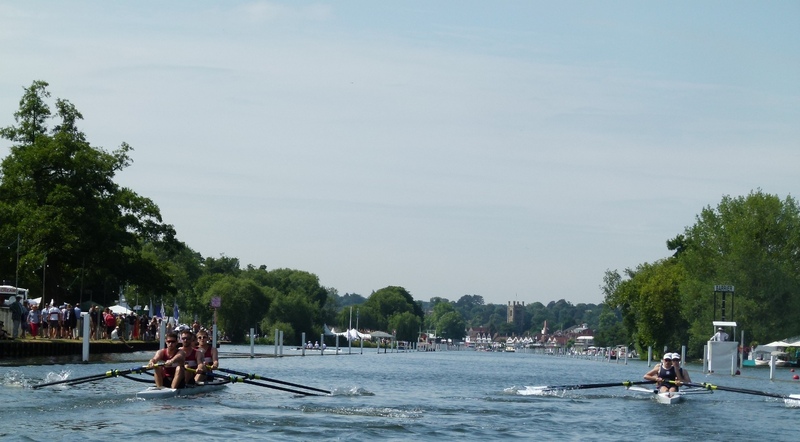 Epic Finish for Stratford at Henley Royal Regatta! Henley Royal Regatta is always the most prestigious regatta of the whole rowing season. It takes place on a beautiful stretch of the Thames, with the races starting at Temple Island and finishing in the heart of the pretty town of Henley on Thames. 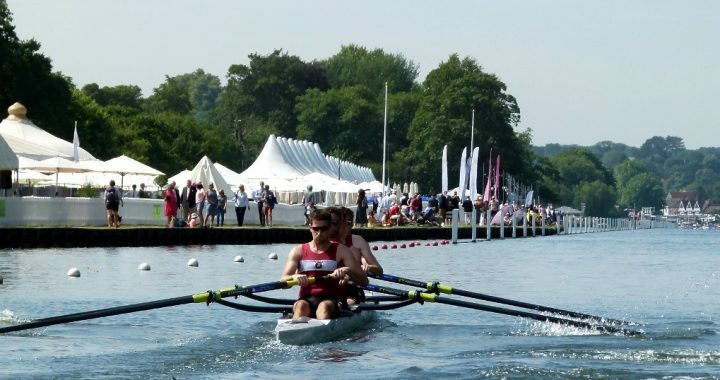 Olympians, international squad crews, the world’s best universities as well as club crews from all over the globe come to compete at Henley at the start of July to try to get their hands on the little red box handed out to winners. 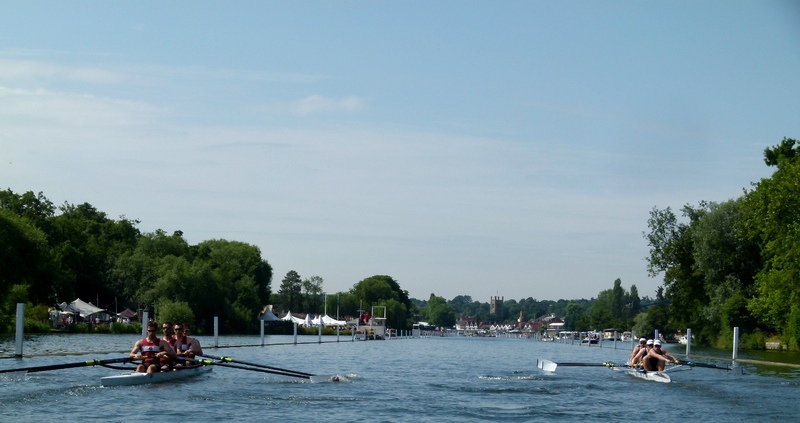 Stratford upon Avon Boat Club were seeking to qualify two boats for Henley this year. The coxless four of Mike Hourigan, Patrick Hourigan, Alistair Collier and Ed Press qualified in the Wyfold Cup after some strong performances in some early season regattas. 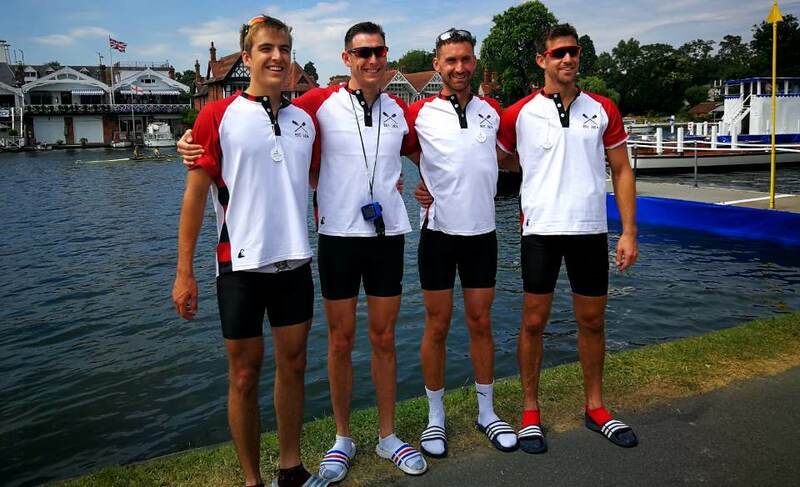 The coxed four of Eleanor Willetts, Chris Thomas, Tom Coles, Ed Lewry and Ben Twiney had to attend a Qualifiers’ Regatta the Friday before Henley to attempt to get into the Britannia Cup at the regatta proper. They needed to finish in the top five crews, but unfortunately finished sixth, as ended as the fastest non qualifier. 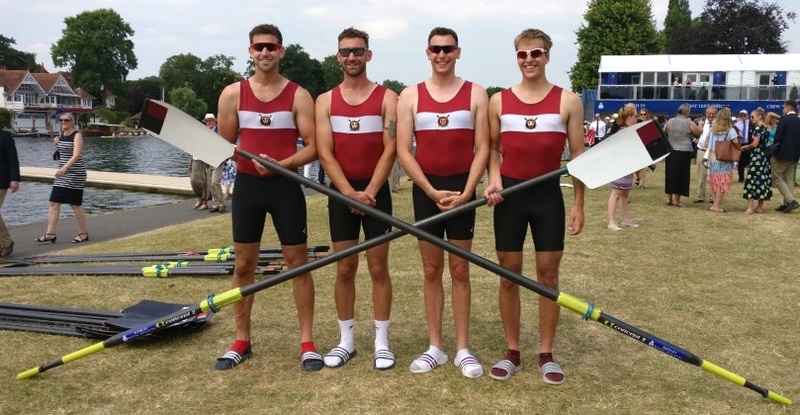 After a weekend of training on the course, which is lined with wooden booms all the way along, the coxless four, only one of whom had ever rowed at Henley before, learnt they were drawn against Swan River Rowing Club from Perth in Australia. The crew from Perth were State Champions and had recently finished third in the Australian championships. 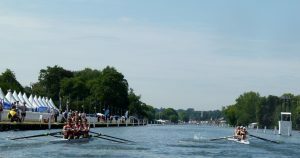 They had also been selected by the Stewards of the regatta as one of the favourites for the race – so the Stratford crew knew they had their work cut out! The race itself, on Wednesday morning, was full of incident. It began with the Swan River crew veering over from the start and drawing a small clash of blades with the Stratford boys before getting back onto their side of the river. They then edged away to a one length lead. But the Stratford crew began to row long and powerfully and slowly started to edge back into the race. At halfway down the course they had reduced the Swan River lead to half a length when the Australian crew veered over the course again taking the Stratford crew with them and forcing them to scrape their blades on the unforgiving wooden booms. Luckily Stratford were able to keep going and moved back into the race whilst the umpire was busy shouting at Swan River to get back on course. As they moved into the enclosures with 500 metres to go, Stratford started to move through Swan River and looked like a win was within their grasp before two small crabs cost them half a length at a critical time, meaning Swan edged over the line a third of a length up. The drama hadn’t ended though. The umpire then held up his red flag meaning he wasn’t satisfied that it was a fair race, due to the clashes along the course and asked the coaches of both crews to join him in the Stewards Enclosure whilst he conferred with the Chairman of the Regatta – Sir Steven Redgrave, over what to do. The solution put forward was to do it all over again – ninety minutes later! Both Stratford’s coach Bill Sullivan and his crew thought that an eminently fair solution as nobody wanted to see a crew, who had travelled half way around the world to race, be disqualified. The second race was another humdinger. This time Stratford got off to a length lead after Swan River took their turn to scrape the booms. But slowly and surely the younger legs of the Swan crew started to assert and they moved into a half-length lead with 500 metres to go. Stratford hadn’t given up though and Mike Hourigan in the Stratford stroke seat asked his crew for one last effort as the cheers for the Stratford boys rang down from the packed enclosures. They edged back closer and closer on Swan as the line approached, but it wasn’t to be with Swan prevailing by just three feet, the closest finish of the whole day. They were two terrific and memorable races and can be seen on the Henley highlights package posted which is on YouTube. After an exhausted Swan River crew were knocked out later in the week the two crews spent a lot of time in each other’s company reliving the race and drinking jug after jug of Pimms.